A group of young conservative online activists have published a plan to revive the GOP. (CNN) –- Rather than pointing fingers and assigning blame for Sen. John McCain’s recent defeat at the hands of Sen. Barack Obama, a group of young conservative activists have issued a manifesto of sorts that challenges the next head of the Republican National Committee to embrace the Internet as a method of political organizing in the same way that the Obama campaign effectively did for the last 20 months. 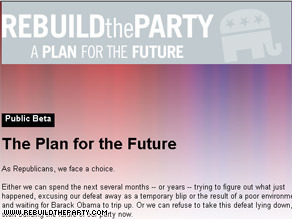 The coalition of eight conservatives, many of whom are known for their activity in the online space, launched the Web site http://www.rebuildtheparty.com on Thursday. The site lays out a set of principles the group believes the RNC must adopt in order to bring the GOP into the future and succeed in upcoming state and federal races. To catch up with the Democrats online, the coalition urges the RNC to recruit 5 million new Republican online activists, hold campaigns and local parties accountable for developing their own e-mail lists and conducting their own fundraising in lieu of relying on the RNC, and adopt a more open technology ecosystem that encourages innovative approaches online and then supports the best of those. The group is also urging the RNC to fundamentally rethink the way that the Republican Party organizes and connects with its base of grassroots supporters. “This isn't just about the Internet - it's about recognizing that in a people-powered era, with the power of technology-empowered grassroots movements on the rise– everything about the way we mobilize voters changes,” the group says. To develop a more-“people-powered” party in the future, the group of activists is encouraging the RNC to reform how its organizes Republicans at the most local, volunteer-to-volunteer level, to move away from large-dollar donors that have historically financed the party and toward fundraising on the Internet from a base of small-dollar donors in the model of the Obama campaign, recruiting 25,000 new campaign workers, and making use of online technologies pervasive throughout the RNC’s operations. Finally, in another approach strikingly reminiscent of the Obama campaign and the Democrat National Committee under Chairman Howard Dean, the group is encouraging the RNC to field candidates in all House races by 2012 rather than just concentrating on those districts that already appear to be leaning Republican, encouraging the GOP’s state parties to contest all statewide races, and setting a “40 under 40” goal of having 40 percent of congressional candidates in who are challengers or running for open seats be individuals under the age of 40. “We must trust the online grassroots who want to take action on our behalf, and who need a decentralized, peer-to-peer volunteer community supported by our campaigns to really be successful. That will require giving up some control - more control than our traditional institutions are used to giving up - in exchange for an exponentially larger and more effective volunteer/donor/activist ecosystem. The coalition is composed of: Erick Erickson, RedState.com’s managing editor; David Kralik; Mindy Finn, the former head of online strategy for Mitt Romney’s presidential campaign; Patrick Ruffini, a former eCampaign director for the RNC; Mark Harris; Phil Musser, a former executive director of the Republican Governors Association; Michael Turk, another former RNC eCampaign director; and Justin Sayfie, former spokesman for Florida Gov. Jeb Bush. See.. good to see that Obama is inspiring and leading by example for all Americans.. Democrat and Republican alike. Republicans like to say that he hasn't accomplished anything.. which is an outright lie. But even if it were true... his innovation and leadership was well demonstrated just in this election alone. These guys are the only Republicans that understand the reality of their situation. If they aren't listened to, the GOP will wither and die. The old men want to 'return to their roots' of taxes and social issues. and i really agree with jeremy. Yep, old ideas. The Federalist Papers contain many old ideas, like limited government, individual liberty, a free market ethos, and similar ancient thoughts. Perhaps we should let our hesitation to abandon the ideas enunciated by Washington, Jefferson, Madison, and Adams, and to look on with horror at western Europe, old ideas, be our guide. There is nothing in the world will help the GOP if they don't loose their outdated and divisive ideology. I live in Appalachia, which is the ONLY region where the Republicans did noticeably better during this election. Appalachia does not have great internet connectivity because of the mountains and the good majority of people aren't the kind of folks who hang out with their laptops checking blogs every minute. The GOP would be wise to understand that. This really won't work for a good 5-10 years at least. The generation that is using all these new media grew up hating Bush (for the most part) for dragging out a long, unnecessary war. I'm now out of college, and I was a high school junior when we went to Iraq. This guy has burned down the conservative image to a Carter-esque degree. Obama is going to be the Democrats' Reagan: As long as he doesn't screw it up any further (I think he'll do the right thing), most of the country will love him forever. Republicans are going to need to grow out of their racist affiliations and become more INCLUSIVE. The white evangelical voting block used to be enough, but the GOP tends to ignore the minority vote. Young people don't like that. I highly agree with this. For the last two weeks, the only Internet ads were for Barack Obama. There were no other Internet ads for anything other than Barack Obama. The GOP needs to get with the online program. Obama's online campaigning definitely helped him, and the GOP needs to follow suit. The only REAL thing they need to do is.....drumroll please.....BE HONEST! also Obama appealed to everyone and the republicans only apeal to rich people. Until the republicans shed the neo con's and the far out religious fanatics and learn that every person is an individual. they will get nowhere. they will be the divisive party. that is their problem. they think that every one should be like them. when they can understand that each person has a right, it may be that they could understand. but i doubt it will ever happen. They should just turn the party over to Ron Paul and his supporters... we already know how to use the internet to our advantage and have remained true to the core conservative beliefs of the party. Ron Paul is the answer to their problem. Amazing. Did they forget what year were in? Welcome to the 21st Century. Let's just hope they manage to get a candidate that knows how to use the internet come 2012. Is it me or are Liberals more "free" than Conservatives? What are Conservatives fighting for in the "Land of the Free"??? The thing is, a Republican candidate already did it. Ron Paul provided a model not only for the GOP, but aspects of his campaign made their way into Obama's strategy. And the fact of the matter was that it was not Paul's online presence that affected the election, but his unpopular views. Like many candidates said, the Internet isn't going to save the GOP. Realizing that one can be small government and relevant to the American people will. GET REAL YOU YOUNG LOOSERS FULL OF HATE. What the hell is the internet? Yea, I guess there's something to that community organizing after all, huh – DUH. Will someone please tell me, what do the Republicans stand for (besides being against abortion and gay marriage)? Republicans have only few answers for all the problems facing the country. Cut capital gain tax for all domestic issues. Tired of hearing over and over. If the Reps want to get our people elected, we need to talk issues and stop the outright lies and mudslinging that characterized the last election. That just hurts the reputation and honor of the party. It would also help to get qualified candidates. I left the Republican Party strictly because of the Extremist, EXclusionary attitude. The old philosophy of "You MUST believe as a fundamentalist Christian" drove me out. That is not the Reagan-era party stance. That is the Newt Gingrich/Pat Robertson era republican party. They are the ones that pushed the Religious Right onto the political stage and demanded obedience. That simply is not going to work with a new generation of acceptance. If they don't put a solid wedge between church and state there will be no resurgence in their future. Can you imagine a Gay person being elected President? Inconceivable? That's excactly what people said about Blacks 40 years ago. Looks like conservatives have a new minority to whip.